Editing Etsy listings is not difficult, but the multiple steps can be time-consuming. The BETSI app makes it so easy and quick to tweak listings and make the changes live with just a couple of clicks. Plus it allows for bulk editing of several or even all of your listings at once, which is something that can’t be done with the Etsy interface. BETSI has two versions: the standard app which can be purchased with a monthly, quarterly, or yearly subscription, and the free app called BETSI-Lite. With the lite version, only active listings can be modified. With the standard version you can make changes to any listing, be it active, inactive, draft, sold out, or expired. There are also over 50 action tools to help with editing (search & replace text, for example). While BETSI-Lite is always free, there is also a free 7-day/20 actions trial available for BETSI Standard. If you’re planning to run any Black Friday or Cyber Monday sales, that might be a good time to try the free trial and save a lot of time bulk editing tags! Melissa, thanks for listing this app. I’ll forward it to my husband, who has an Etsy store. Great, I’m so glad you think your husband might find it useful. Thank you for stopping by! 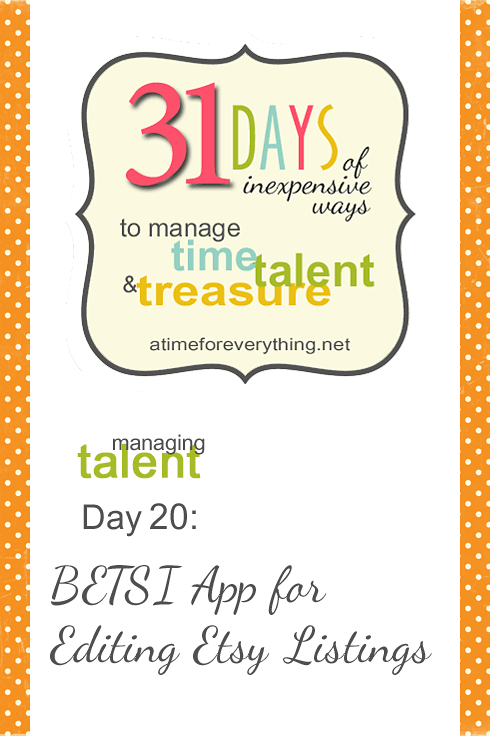 I find Betsi Lite very helpful. During the Christmas Rush I’ve noticed that a lot of shoppers don’t make it to the shop announcement to read my Holiday Delivery updates. This year, I used Betsi Lite to add a statement to the beginning of all of my listings, and use find and replace to update the statement every day. That way, my customers don’t have to send a convo for the information they need, and putting in today’s date helps reassure customers that they have the most current info, and that I’m on top of my shop.